Well I finally laid that ghost to rest. Finished the 3 peaks in 4h 43mins. Very glad to have completed but disappointed as I sprained my foot coming down Penyghent (first peak) with about 20 miles to go. It didn't bother me on flat ground (which was about 5% of the race) but on the rocky paths and downhill sections (where I normally make up for my slow ascents) I had to slow down and spent half my time hopping and hobbling when I caught the sprain. I also find it a lot more tiring to slow down on the downhills than just letting rip. It had me seriously worried just after I did it as when I got it it was so painful I had to pull up but eventually I realised it eased off after about 50 yards (until the next time). I reckon I could have cracked 4 30 without the sprain. 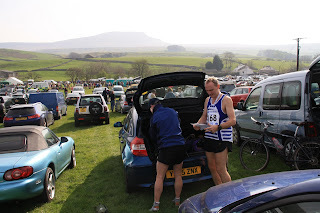 This photo shows my mate Dave (right) and his teammate Adrian (both Bingley Harriers) getting ready for the start. In the background you can just make out Penyghent through the haze. This was the first and by far easiest peak. We got to the top in 43 mins. As you can see the weather was fine. It was perfect running weather, sunny with a cool breeze (gale on the tops). I was aiming for 45 mins so a good start. It was then a long drag across to Ribblehead Viaduct before the climb up Whernside (where I packed last year). I reached Ribblehead in 1h 47m, ten minutes up on last year and feeling in a much better state. I was running just behind Adrian after Ribblehead when he did a spectactular face plant (fall). He was a bit shaken but otherwise OK (apparently he then fell again a mile later while crossing a stream). He picked himself up and managed to finish OK. Another Bingley runner crashed in a similar fashion on the top of Whernside, and on the way down a woman runner was being attended to after tripping. A lot of the path surfaces were very dangerous being covered in sharp irregular rocks. It made running with my sprain almost impossible in places. The wind was so strong on the top that I had to fasten my hat down with my buff diadem style. The track down off Whernside gave me some serious problems with my sprain. I could hardly move without setting it off. I must have hopped most of the track along the top then dropping down the steep rocky edge was a nightmare. Eventually made it to the bottom and was fine on the track to the Hill Inn checkpoint. This was my main target as it was the last checkpoint where you could be timed out. At the start I'd hoped to make it inside the 3:30 cut off. I made it in 3:04. From then on it was just a case of keeping going to the finish. Just the small issue of Ingleborough to contend with. The ascent was similar to Whernside with a steady drag up to a vertical hands and knees section onto the shoulder then the final climb onto the top. I was at the top in 4 hours. Then it was what should have been an enjoyable cruise down to the finish at Horton but turned into a cautious hobble. My foot went about a dozen times, each time me having to stop or limp until the pain wore off. I made it down in 43 minutes but reckon I could have done it a lot faster in normal conditions. Managed to grab a good half dozen places on the final sprint for the line. I finished 399th out of 614 finishers from 688 starters and 45th out of 120 in my age category. Overall I'm pleased with the results especially considering my lack of hill training and mileage. Dave did a cracking 4:04 taking something like 30 minutes out of me on Ingleborough. Adrian came in some 5 minutes behind me after his two tumbles. Unlike last year when I made some stupid errors, this year it all went to plan (apart from leaving my prepared drinks behind in Dave's kitchen. I had to rush around getting replacements before the start.). I ended up running in my Salomon XA-Pros instead of the Inov-8 Mudclaws as the ground was so dry. They were fine (only one black toenail). I got the drink, gels and bars just right. I had 2 litres of isotonic drink, a few cups of water, four energy gels and an energy bar. My thighs ache a bit today but that's to be expected considering the training. After a lovely recovery meal at Dave's (thanks to the lovely Angie) I drove back down south (3 hours on cruise control) to be home for Rosie's birthday (today). Not sure I'll do it again as it clashes with Rosie's birthday, unless she wants to join me of course. Yeah right! Thanks Umberto. I couldn't let that one beat me. There's still life in the old dog.